Working in creative harmony, art collaborators Doni Jordan of Columbia, SC and Janette Grassi of Charlotte, NC have created 5 artful violins, 4 for the South Carolina Philharmonic and one for the Chapin High School Philharmonic. They added paint, typography, heavy string and feathers to their violins. 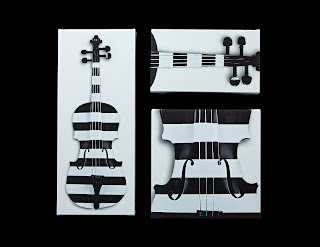 However, their favorite solution was play, a rhythmic painted violin which they created in 2008 and derived inspiration from the black and white lines on a printed score of musical composition. Featured on the cover of the 2008 art benefit program and also in Painted Violins, a small commemorative handbook designed by graphic designer and artist Lani Stringer to benefit the South Carolina Philharmonic, Jordan and Grassi decided to revisit play again this year. So, they took the original photograph of the image by Les Stringer and with the help of nature photographer, Kent Porth, expanded the image it to create a tryptic on canvas. play: 02 is one of 15 violins and six guitars that will be included in Painted Violins which opens on Thursday, March 7, 2013 from 6 to 9pm at the Anastasia and Friends Gallery at 1534 Main Street, Columbia, SC, across from the Columbia Museum of Art. A closing reception will be held on Tuesday, April 9 at Gervais & Vine at 620 Gervais Street, Columbia, SC from 5 to 8 p.m. Both receptions are free and open to the public. Since it began in 2006, Painted Violins has raised almost $30,000 for the educational programs of the South Carolina Philharmonic.